Suburban Station Art Deco Facade, 16th Street and John F. Kennedy Boulevard. 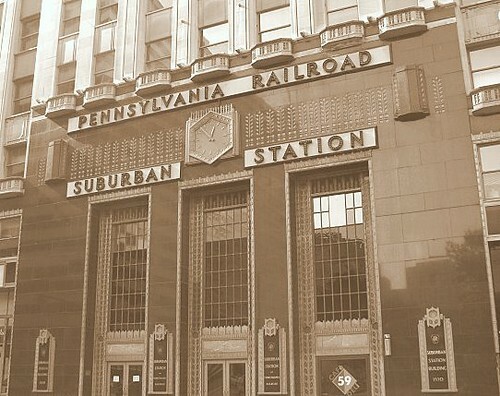 Constructed in 1930, this sepia-toned photograph shows how Philadelphians would have seen the crown jewel of the Pennsylvania Railroad, as pictured in the newspapers of the time. Located at 16th Street and JFK Boulevard, it opened in 1930, and was built in an impressive Art Deco architectural style. Its black and gold exterior facade, visible on the southeast corner of 16th and JFK, evokes the early 20th century, the Golden Age of passenger train travel. How Long Will It Take for My Train to Reach Suburban Station? 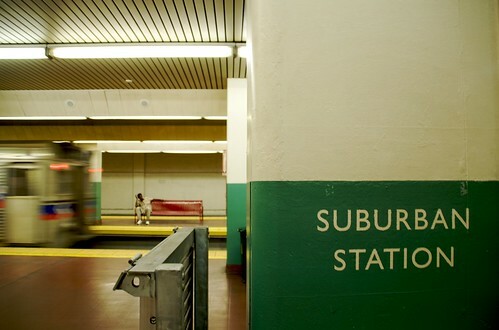 We have assembled a Travel Times to Suburban Station page, to answer that question - just click on that link, to see the approximate travel time from every Regional Rail train station to Suburban Station. All trains will arrive via tunnel. No matter what train you are on, you will arrive at Suburban Station in the dark, and all of its tracks are underground. It has a very large and confusing underground Concourse, stretching several blocks. SEPTA has done well at providing signs to help guide visitors, especially those from out of town or infrequent train riders, to find their way. Confused by all of the rule changes? Whatever happened to Peak and Off-Peak fares? We've sorted it out for you, to understand the new fare structure that went into effect on July 1, 2010... check out our comprehensive Guide to SEPTA Regional Rail Fares - to help you sort them all out. If I Am Going to Visit ____ in Center City Philadelphia, Where Should I Get Off My Train? All Ben Franklin Parkway attractions are much closer to Suburban Station, than they are to either Market East Station or 30th Street Station. Regarding the Museum of Art, you can walk there, from Suburban Station. However, unless you have a lot of time or you're a walking enthusiast, we wouldn't recommend walking all the way up to the Parkway, between 24th and 25th. It's really far, particularly if it's hot and humid - as it so often is, during peak visiting season in Philadelphia. Instead, what we'd recommend for the Museum of Art, is that after you emerge from Suburban Station, that you jump on the purple Phlash Trolley for $2. That will give you a very pleasant ride up the diagonal Ben Franklin Parkway, taking in the beautiful museums and landscaping design of the boulevard. It will also deposit you directly behind the back door of the Museum of Art. And you can also jump on the Phlash at the same place, for your return trip. When you emerge at 16th and JFK, if you go out the front doors, you'll be able to see City Hall and the statue of William Penn. Just walk in the direction of the building - it's about a two-to-three block walk. If you'd like to leave Suburban Station, and return to the SEPTA Regional Rail Guide, please click here.